Drive growth with professional, branded representation of your organization online. Keep alumni/alumnae engaged by giving them easy resources to stay in touch. A website that consistently represents your organization's branding elements. Celect makes community networking simple by clearly defining how each part of your fraternal organization works together online. Networked website packages with Celect give you the opportunity to collect member data rich in resources for donation and networking outreach. Your organization also benefits from a unified and consistent image online, putting you at a huge advantage for membership growth. Shared pages for local chapter websites ensure your brand message online stays consistent. Leverage donation outreach, engagement and professional networking info for all of your members. Syndicate organization news at the national level down to local groups and the public. Communicate and plan online between chapters & colonies and your national headquarters. Your own private social network for headquarters and chapters, free with your websites. Communication is the fundamental part of driving your fraternal organization towards growth. You can’t manage how you stay in touch with your members by using Facebook or other social networks—but your own private social network with Celect becomes the main touchpoint for how members of your organization interact, plan, schedule, task, communicate, grow and build an identity for your organization across the country. Celect’s member management tools give you the opportunity to do exactly that. Each member creates his/her own profile and uses features like groups, forums, messages, events, newsfeeds and more to enhance communication and planning for recruitment, house management, social planning—and anything else you can imagine. It also helps you stay in touch with alumni and alumnae. Plan recruitment strategies using forums, messages and groups. Sell t-shirts through your payment portal. Post chapter policy documents to give members easy online access to resources. Keep members updated on chapter news. Sometimes, the budget for technical staff is stretched thin. With Celect, you don’t have to hire on programmers or developers; our content management system (CMS) gives you the ability to maintain and update your own headquarters website without extensive tech expertise. Your members and alumni/alumnae are rich in useful information for improving recruitment and driving the growth of your organization. When your members create profiles through Celect, you have access to information that puts you at a huge advantage for the health of your fraternal organization. Celect’s profile feature gives your members the ability to share information within your chapter’s community that they might not want to share on a public network like Facebook— like phone numbers, alternate emails, street addresses, messenger accounts and more. While members have the ability to only share designated information, your site administrator has access to everything. Collect due payments through chapters. Celect's Branded Chapter Sites solution provides your chapters with visually attractive websites while helping you ensure that your brand is represented effectively. 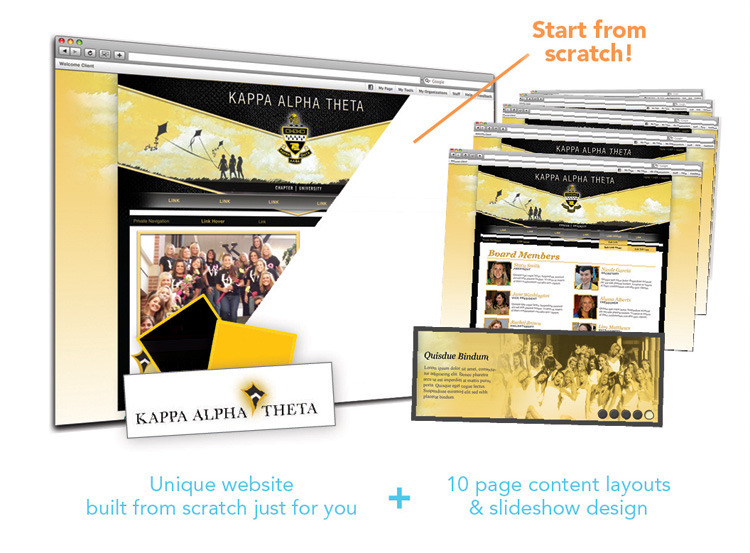 Celect works with your organization to develop five custom branded website templates for your chapters to choose from. As a Celect Preferred Partner, you name Celect as your organization's exclusive website provider. Your headquarters pays a reduced one-time setup fee and all hosting and service fees for every chapter in the organization. Our Sponsor Package requires a strong endorsement from your organization, naming Celect as the organization's official website provider. For each chapter that signs on with Celect, your headquarters pays a reduced one-time one-time setup fee and all hosting and service fees. Our Advocate Package requires a strong endorsement from your organization, naming Celect as the organization's official website provider. Each chapter gets a reduced one-time setup fee and is responsible for hosting and service fees.